Thank you to those who attended our Easter Liturgy and our Learning Expo. I hope you enjoyed both these events as much as the students did sharing their learning with you. As this is the last newsletter for term one I wish you all a safe and restful holiday break. School reopens on Monday April 30th for the start of the new term. Being purposeful is having a clear focus, instead of being confused or unsure of what you are doing or why you are doing it. You are acting purposefully when you have a goal you are working toward. You concentrate your mind and your efforts so that something good will happen as a result. Some people just let things happen. A purposeful person makes things happen. Thank you to the PTFA and Rebecca Hayman for organising new sandpit equipment for our students. Please return them asap so teachers can start putting this year’s assessment in them ready for conferences next term. If you would like or know of someone who would like to sponsor our newsletter please be in touch. Sponsorship covers the cost of our newsletters so we are very grateful to all our sponsors. 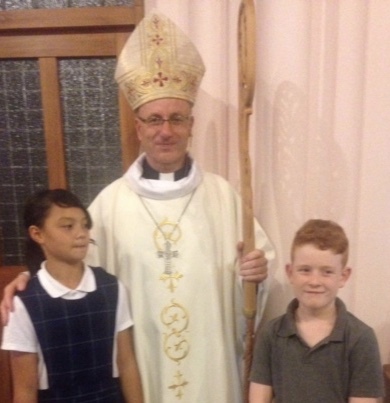 Congratulations to Flynn and Shakariah for the splendid job they did representing our school at the Mass of the Oils and on Holy Thursday. A reminder to those who have obtained items from school and were to pay on the internet or at a later date. Your early attention to this would be appreciated. This includes uniform & stationery items unless prior arrangements made. Accounts are being made up at the present time. Congratulations to Tamara and Olivia who have moved up a stage on the ladder. Music tuition here at school is well under way with Epic Music Academy! If your child(ren) hasn’t signed up yet for music lessons on the drums, guitar, ukulele or keyboard make sure you email your interest to alistair@epicma.nz or head along to their Facebook page. Students all must be in correct winter uniform after term break. The office has 2 x 97cm Jerseys ($55) 1 pr winter shorts size 10 ($25) and socks $10 pr. We do have some larger tunics available. Inquire at office. All sizes & items available at The Warehouse. P.E. Top Size 8-10 named Erin Deeley on hem line. Missing for 2 weeks. Tunic named Veiana since last Friday. This is the second tunic missing this term. First Eucharist programme commences on 28th April (last Saturday of the holidays) at 4.30p.m. followed by 5.30p.m. mass. Y1/2 due in now. Last call for names. Be-Bop will run a programme over the upcoming school holidays. Information brochure from school office. Starting Term 2, Monday 30th April. Kids 5-10 years 3.30pm, Teens 11-17 years 4.30pm. For more information go to www.atyoga.kiwi or ph Tracy 021525669. Limited to 20 mats so booking essential.